University of the Witwatersrand, South Africa. This paper presents an overview of an ultrasonic signal-processing technique called Split Spectrum Processing (SSP). This technique first published in 1979 uses frequency diversity to improve the signal to noise ratio of a signal such that coarse-grained materials can be more readily inspected. SSP does not allow for the sizing of flaws using any conventional means, since the amplitude of the processed signal is non-linear. Although this technique has been used in a number of case studies over the years, this survey suggests that the use of SSP in industrial or medical applications in its current form is limited. Further advancements in the field of SSP are therefore required before this technique can become commercially viable. Split spectrum processing, SSP, grain noise, ultrasonic signal processing. In the case of industrial ultrasonics, the scattering of a signal is due to the metallurgical grain structure of the material being tested. This scattering results in grain noise. Increasing the wavelength used can reduce this grain noise to tolerable limits. However increasing the wavelength also sets a lower limit to the detectability of small flaws. A casting may have large grains, with the maximum grain size reaching over 400 microns. To eliminate the grain noise from ultrasonic inspections would therefore require wavelengths one order of magnitude larger than 400 microns, i.e., in excess of 4000 microns (4mm). Planar flaws smaller than 4mm therefore become difficult to detect. In addition to this, flaws are not typically planar, but follow grain boundaries. The resulting flaws will therefore have an extremely small planar area, even in the case of large flaws. A real flaw will reflect all wavelengths smaller than the flaw size. However in the case of a grain boundary, not all smaller wavelengths are reflected. This has been shown graphically in Figure 1, where a real flaw is shown as the top solid line, while a grain boundary is shown as the bottom dotted line. Multiple frequencies (in the form of a chirp signal in the figure) can then be transmitted onto these two boundaries. In the case of a real flaw all frequencies are reflected, while in the case of a grain boundary only a subset of the frequencies are reflected. This phenomenon has been termed frequency diversity . Fig 1: Frequency diversity of a real flaw versus a grain boundary. Split Spectrum Processing (SSP) uses this frequency diversity to determine if a signal originates from a real flaw or a grain boundary. The implementation of SSP therefore makes use of multiple frequencies to inspect a component. This is best achieved by the use of a broadband signal (such as an impulse for excitation of the probe), which can then be decomposed into a number of frequency bands. The general algorithm for SSP can also be optimised by performing the filtering in the frequency domain, resulting in a flow diagram for SSP as shown in Figure 2. Fig 2: Flow diagram for Split Spectrum Processing. For the purposes of this discussion, a sample RF wideband signal is used throughout this paper, as shown in Figure 3. This signal was generated using a 0.5MHz to 4MHz ultrasonic probe, on a 79mm thick austenitic casting. The casting was machined with a 5mm flat bottom hole, 11mm deep from the back wall of the block, as shown in Figure 4. Fig 3: Sample signal captured with a 0.5MHz to 4MHz ultrasonic probe. 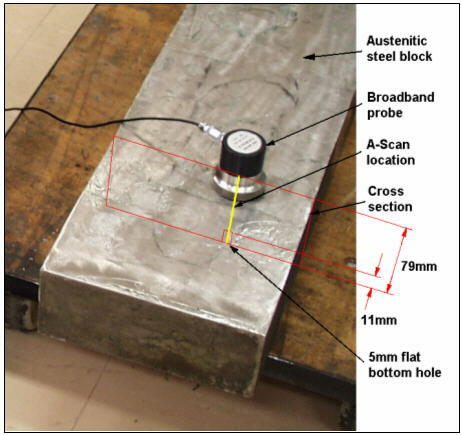 Fig 4: Ultrasonic probe on an austenitic steel block. The sample signal can now be processed using SSP techniques to determine the capabilities of SSP, and for a comparison of the various recombination algorithms used in SSP. The first step in SSP is to obtain a number of frequency components from a specific ultrasonic signal. This can be achieved by filtering the original signal through a set of band-pass filters. The number of frequency bands (band-pass filters) varies in the literature from only three bands, to as many as two hundred bands. The reasoning for this is that each discernable frequency in the frequency spectrum of the digitised signal can be used. Literature suggests that as the number of frequency bands are increased, so the final S/N ratio can be improved. However this improvement quickly asymptotes, while the required processing power increases linearly with each additional filter. Compromising between processing power and S/N improvements has resulted in a tendency to use less than 10 band-pass filters. Since the usable signal must come from the transmitting transducer, as well as be received and measured by the receiving transducer, the filters need only cover the bandwidth common to both transducers. The total bandwidth of a transducer is usually defined by the –6dB drop-off point (50% amplitude), and this is carried through in most SSP applications. However M.Pollakowski et al. suggest that the usable bandwidth can be increased to 1.14 times this value. In some instances, the filters have been proposed that have an upper limit less than that of the transducers, since grain noise is more significant at higher frequencies, i.e. the reflected signal has no energy content at higher frequencies as it has been scattered/attenuated by the grains, and these high frequency components are therefore un-usable. The selection of the bandwidth of the band-pass filters or frequency bands has been addressed in literature, and general consensus is on the use of equal bandwidth filters. An exception to equal bandwidth filters is the use of filters where the bandwidth is proportional to frequency i.e. wider bandwidth at higher frequencies, since the attenuation due to grain noise is higher at these higher frequencies. This method is also used for the optimisation of wavelet filtering in SSP. All the literature listed in the references made use of Gaussian filters with the exception of , which made use of raised cosine filters with a flat top. A number of references  make use of wavelet transforms or wiener filters using a modified SSP algorithm, where the filter is a Gaussian filter, but the bandwidths are frequency dependant. The difference between these two filters is that in a Gaussian filter, 30% of the energy is in the stop band, while this was only 9% for the proposed raised cosine filter. The reasoning for the use of the Gaussian filter was not explicit in any of the papers, except when mentioning the ease of implementation. Fig 5: Overlap of filter pass-bands. For purposes of comparing the various SSP algorithms, the signal presented in Figure 3 has been filtered with the use of six Gaussian filters, resulting in six filtered signals as shown in Figure 6. The filters intersected at the -6dB point, but the bandwidths were selected such that each filter contained equal amounts of signal energy. This filter selection was made to ensure that no individual filter dominates the process. Fig 6: Sample A-Scan decomposed into six frequency bands. Once the signal has been decomposed into a number of frequency bands, these frequency bands (filtered signals) are recombined. This recombination technique must determine where all frequencies exist, and hence which part of the signal originates from a real flaw. A number of techniques have been developed for this recombination. Polarity threshold with probability scaling, also called polarity with scaling. Squaring and adding frequency components. In addition to these techniques, a number of permutations have been proposed and evaluated, including: raising each filtered data set to a power (x) and adding, or multiplying data sets together, where x ranged from 0.25 to 4. All the SSP techniques discussed in literature are therefore non-linear with respect to amplitude. A -Amplitude of the signal following SSP recombination (the resultant signal). X - Amplitude of the signal after filtering as shown in Figure 6.
n - Subscript for the filter number (e.g. between 1 and 6 for a 6 filter system). i - Subscript for the sample number (related to depth by the sound velocity and the sampling rate). Ai therefore indicates the amplitude of the recombined signal at sample point i, while Xni indicates the amplitude of the signal at sample point i for filter number n.
For each recombination algorithm, the SSP result has been shown, with the value for the signal to noise ratio between the 5mm flat bottom hole and the previous 15mm of material. Note that no units for amplitude are used in this comparison, since the processed signal has dimensions depending on the recombination algorithm, and is somewhat meaningless. The minimum amplitude when all filters have the same sign, or a zero. The minimum amplitude multiplied by a function of the number of filtered signals with the same sign. Filtered signals are multiplied together. Where x is a constant ranging between 0.25 and 4. The 'phase deviation' approach is similar to the 'polarity with scaling', where 'phase' refers to the polarity (sign) of the filtered signals. Table 1: Signal to noise ratios of various SSP algorithms. From this we see that the 'polarity thresholding' and the 'polarity with scaling' give similar results, however lower amplitude signals are still apparent in the 'polarity with scaling', showing possible flaws at much lower amplitudes. The signal to noise improvement from 1.14dB to 10.56 dB for this particular signal is significant. It must be noted that the low amplitude signals could be real (but small) flaws, and have been included as grain noise in the calculations. The calculations are therefore a worst-case calculation. Advantage:Detect range measurements more accurately (not all recombination techniques). Disadvantage:Loss of signal energy, cannot size reflectors using conventional techniques. Conventional techniques for sizing flaws include DGS (distance gain size), DAC curves (distance amplitude correction), reference block method, scanning method (e.g. 6dB drop off), and pattern type analysis. Each of these techniques makes comparisons in echo amplitude for sizing flaws. Since the resultant amplitude of the SSP signal is non-linear, comparisons can no longer be made, and these conventional sizing techniques cannot be used. Alternative sizing techniques have not been proposed in the literature on SSP. A number of studies have been performed to improve the capabilities of SSP by investigating the nature of grain noise. These studies have indicated that grain noise can be approximated algebraically, e.g. by a Gaussian stochastic process. By modelling grain noise algebraically, it has become possible to analyse variations in SSP with the aim of optimising SSP algebraically. This has resulted in the requirement for additional data when creating the filters, such as: grain size and position, distribution, elastic constant distribution within the material, experimental data or commercial information about the probe being used, material frequency response and others. These studies have shown that the number of filters used in SSP can be reduced to less than ten without loss in performance. However the varying material properties in an inspection requires adaptive filtering, which requires increased processing power, negating the optimisations obtained by the reduction in the number of filters. In efforts to correct for the non-linearity of SSP, attempts have been made to use the filtered signal as a gate for the original unprocessed signal. If the SSP result is above a certain threshold the original signal is output, otherwise the signal is zero. This has shown promise for sizing capabilities within SSP, however due to the high frequency of the filtered signal, this has shown limited success to date. Split spectrum processing has shown promise in the laboratory, where it has been shown to improve signal to noise ratios. This improvement in signal to noise ratio has the sole benefit of enabling the detection of flaws which were previously within the noise levels. SSP does not allow for the sizing of flaws using any conventional means, such as DGS (distance gain size), DAC curves (distance amplitude correction), reference block, scanning method (6dB drop off), energy content or even pattern type, since the processed signal is non linear. The use of SSP in industrial or medical application is therefore limited. Modeling of grain noise has not made a significant impact on the ability of split spectrum processing, while requiring additional knowledge of the block under test, which is impractical in field conditions. I would like to thank Eskom Resources and Strategy Research Division for providing the funding that made this research work possible. I would also like to thank Manfred Johannes, Willem Nel, Hugh Neesen and Amanda van der Westhuisen from Eskom Enterprises for their technical support and assistance in this work, and Dr Charles Pritchard at the University of Witwatersrand for his supervisory inputs. N.M. Bilgutay. J.Saniie E.S. Furgason and V.L.Newhouse, Flaw-to-grain echo enhansment. Proceedings. Ultrasonics International 1979, 1979 pp 157, Austria. N.M. Bilgutay, J Saniie. The effect of grain size on flaw visibility enhancement using split spectrum processing, Material evaluations, Vol. 4, No.2, May 1984, pp 808. Qi Tian and N.M.Bilgutay, Statistical analysis of split spectrum processing for multiple target detection. IEEE transaction on ultrasonics, ferroelectrics and frequency control, Vol. 45, No1, January 1998, pp 709. J.D.Aussel. Split Spectrum processing with finite impulse response filters of constant frequency-to-bandwidth ratio. Ultrasonics Vol. 28 July 1990. P.Karpur, P.Shankar, J Rose and V.L.Newhouse. Split spectrum processing: optimising the processing parameters using minimisation. Ultrasonics, Vol. 25, July 1987, pp. 204. P.Karpur, P.M.Shankar, J.L.Rose and V.L.Newhouse.Split. Spectrum processing: determination of the available bandwidth for spectral splitting. Ultrasonics Vol. 26, July 1988. Shankar P.M. U.Bencharit, N.M. Bilgutay and J.Saniie. Grain noise suppression through band pass filters. Material evaluation Vol.46 No8 August 1988 pp 1100. J.Saniie. D.T.Nagle, K.D.Donohue. Analysis of order statistic filters applied to ultrasonic flaw detection using split spectrum processing. IEEE transactions on ultrasonics, ferroelectrics, and frequency control. Vol. 38 No 2 March 1991. P.M.Shankar, P.Karpur, V.L.Newhouse, J.L.Rose.Split. Spectrum processing: Analysis of polarity thresholding algorithm for improvement of Signal-to-noise ratio and detectability in ultrasonic signals. IEEE transactions on ultrasonics, ferroelectrics and frequency control Vol. 36, no 1 January 1989. V.L. Newhouse, GuoYao Yy and Yue Li. A Split spectrum processing method of scatterer density estimation. NATO ASI series Vol. F44. Signal processing and pattern recognition in non-destructive evaluation of materials. 1988. Meric Karaoguz N.Bilgutay, Tayfun Akgul and Sandor Popovics. Ultrasonic testing of concrete using split spectrum processing. Materials evaluation, November 1999 pp 1183. N.M. Bilgutay, U. Bencharit, J. Saniie, Enhanced ultrasonic imaging with SSP processing and polarity thresholding, IEEE trans ASSP, Vol.37, No10, 1989, pp.1590. Y.J.Chen, Y.W. Shi and Y.P.Lei. Use of wavelet analysis technique for the enhancement of signal to noise ratio in ultrasonic NDE. Insight Vol. 38. No 11 November 1996. A.Chambolle, R.DeVore, N.Lee, B.Lucier. Non-linear Wavelet image processing: variational problems, compression, and noise removal through wavelet shrinkage. IEEE transactions on image processing Vol.7, 1998, pp319. Emmanuel C. Ifeachor. Barrie W. Jervis. Digital signal processing: A practical approach. Addison-Wesley. Truong Nguyen and Sriram Jayasimha. Polarity coincidence filter banks and non-destructive evaluation. pp 497. M.G.Gustafsson. Split spectrum algorithms rely on instantaneous phase information –A geometrical approach. IEEE transactions on ultrasonics, ferroelectrics, and frequency control. Vol. 40, No 6, November 1993. pp 659-665. Liu Zhenqing, Ta Dean, Liu Xiao.. A Phase deviation based split-spectrum processing algorithm for ultrasonic testing in coarse grained materials. 15th World Conference October 2000. Rome. H.C. Sun, J.Saniie, Non-linear signal processing for ultrasonic target detection. IEEE Ultrasonics symposium, Proceedings Part 1 Vol 1, 1998, pp 855. K.D.Donohue, J.M.Bressler, T.Varghese and N.M.Bigutay. Spectral correlation in ultrasonic pulse echo signal processing. IEEE transactions on ultrasonics, ferroelectrics, and frequency control. Vol. 40, No 4, July 1993. B.Baligand, M.Grozellier and D.Romy. Improvement in ultrasonic examinations of austenitic steel. Materials evaluations Vol. 44. Pg 577 1986. J.L. Bartos, D.C. Copley, R.S. Gilmore, P.J.. Howard, G Mangenet, L.Beffy, R.Crole, P.Martin. Advanced ultrasonic inspection techniques for titanium billet materials. Conference: Titanium 1995. Vol. II, Birmingham UK, 22 Oct. 1995. Publ: Institute of materials. L.Adler. J.H.Rose and C.Mobley. Ultrasonic method to determine gas porosity in aluminium alloys: theory and experiments. Journal of applied physics. Vol. 59, No.2, 1986, pp 336. M.Karaojiuzt, N.Bilgutay, T.Akgul, S Popovics. Defect detection in concrete using split spectrum processing. IEEE ultrasonic symposium, Proceedings Part Vol. 1 1998, pp 843. M.G. Silk. The ultrasonic inspection of difficult materials. Non-destructive testing. Proceedings of the 4th European conference. 1987 Vol. 1 pp 1647. N.M. Bilgutay and R.Murthy, Application of split spectrum processing to medical imaging, ASNT Fall conference and quality testing show, October 1997 pp 235.